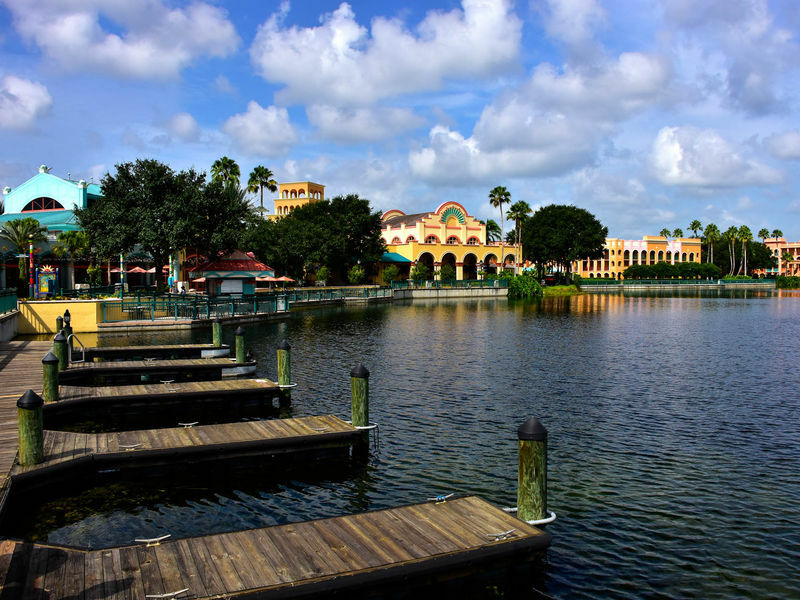 Coronado Springs is the main convention resort at Walt Disney World with almost 100,000 square feet of meeting and convention space available. Themed to the architecture of the desert Southwest and Mexico, the resort has three distinct architectural villages exploring those areas. The entire resort circles Lago Dorado, a large lake. In the middle of the lake is an island that includes the Dig Site swimming pool, the centerpiece of which is a Mayan pyramid with waterfall. One drawback of this resort for many is the sheer size of the place. A room in the "Ranchos" section of the resort will put you almost a half-mile away from the restaurants and services found in the main "El Centro" building. If that isn't a concern, however, then Coronado Springs provides a pleasantly-landscaped, quiet option. Additionally, Coronado Springs is currently one of the Moderate resorts that has queen-sized beds in its standard rooms. Room Rates: For standard rooms at Coronado Springs you have a choice between rooms with a view of the center lake or rooms with views away from the lake (generally towards self-parking lots). See the official Disney page for Coronado Springs for current room rates. Laundry: Each of the three different guest sections of the resort has a standalone laundry building with token-operated machines near the quiet pools. Tokens may be purchased in the laundry facilities. Valet dry cleaning and laundry services are available with same-day return. Pools and Swimming: There is no swimming or wading in the center lake. Each of the three guest sections of the resort has its own quiet pool. The resort's themed pool is called The Dig Site and is themed to an archaeological dig site in Mexico. A large pyramid is the centerpiece of the large main pool (about 120 feet by 100 feet) that has its own waterslide. Gym and Exercise: The La Vida Health Club in the main building is free to resort guests and has a good selection of exercise machines as well as free weights and aerobic space. A resort jogging map is available on request; suggested paths are approximately one mile. Spa: The spa is located in the Casitas area next to the La Vida Health Club and offers various massage and spa treatments by appointment. Casa de Belleza Salon offers hair and other beauty treatments. On foot: There is a sidewalk that connects the resort to Blizzard Beach, Winter Summerland miniature golf course, McDonald's, and the All-Star Resorts along Buena Vista Drive. Bus: Coronado Springs has four bus stops around it and direct routes are offered to the four theme parks, Disney Springs, and the Blizzard Beach water park. Any other destination will require transferring to another bus at one of those places. Maya Grill Serves dinner daily featuring Mexican and American fare. Pepper Market Quick service food court with several individual stations. Cafe Rix offers take-out items for breakfast, lunch, and dinner in the El Centro building. Rix Lounge – a 5000 sq. ft. nightclub and lounge in the El Centro building open in the evenings; it regularly features live entertainment. Siestas Cantina – at the Dig Site pool has counter-service breakfast and lunch in addition to bar drinks. Laguna Bar – a lakeside bar near the El Centro building. Iguana Arcade, at the Dig Site swimming pool. Beach volleyball nets are set up around the lake. Balls may be checked out at Siestas Cantina with valid resort ID. The Explorer's Playground allows children to play in and around the pyramid at the Dig Site swimming area. Campfire activities with marshmallow roasting. Panchito's Gifts and Sundries A large store that not only sells the standard hotel sundries and logowear, but also native Indian and Mexican handcrafts.